Entries from Digital Intelligence tagged with "iab uk"
IAB UK, the trade body for the online advertising industry, has launched of the ‘Transparency FAQS’, a tool to help aid advertiser understanding of the value they derive from companies within the digital advertising value chain. 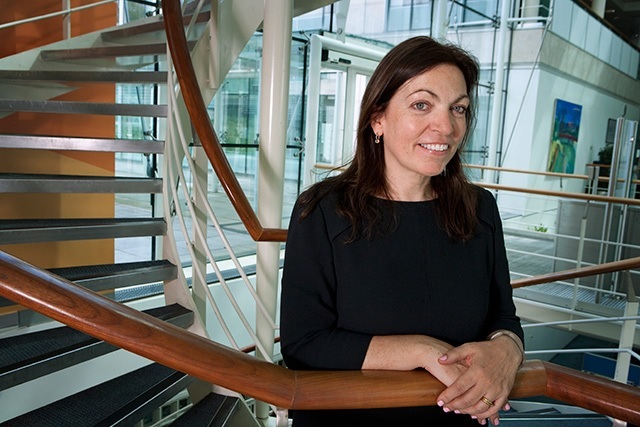 The Internet Advertising Bureau (IAB) UK has today announced the appointment of Roisin Donnelly to spearhead its advertiser engagement work. Mobile ads now account for 10% of all digital spend in the UK, growing by a massive 148% compared to last year, according to the latest figures. Mozilla’s new Firefox browser cookie settings, which will come into effect in early April and will block third party cookies by default, have come under fire from the UK’s digital advertising trade body. Affiliate marketing is generating £11 in sales for every pound spent for brands, according to a new report from the IAB. The overall digital ad spend during the period was £2.59bn, up from the previous year. The suggested reason for the rise in digital adspend is the statistic that 58% of the UK now own a smartphone. 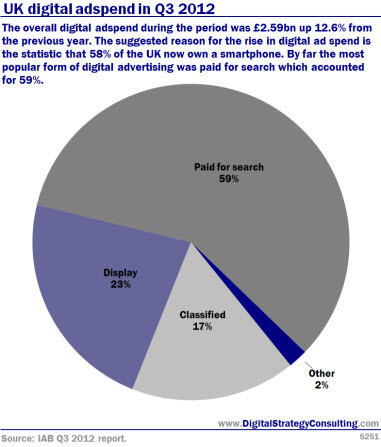 By far the most popular form of digital advertising was paid for search which accounted for 59%. Dwell time is two minutes higher when brand sites are mobile-ready, but less than half of top UK brands have websites optimised for smartphones and tablets, according to a new study. The study proved how a significant percentage of the top 100 brands such as Tesco, B&Q and Boots are starting to sit up and listen, with nearly 40% now having a mobile-optimised website. UK advertising on the internet and mobiles increased 12.6% year compared to the same period last year, accounting for £2.59bn in the first half of 2012, according to the Internet Advertising Bureau. The UK trade body found that a ‘meteoric rise in mobile’ drove much of the growth. With 58 per cent of the UK population now said to own smartphones according to the IAB, mobile advertising has continued a "meteoric rise". It was said to be up 132% to £181.5m. New research published by the IAB in conjunction with its partner Ipsos MediaCT, has found that consumers are more than twice as likely to be engaged with tablet ads that are interactive. Overall, 55% of tablet users think that advertising on tablets can do things that other media can’t and they expect to see this functionality incorporated into the adverts they see. However, 30% of the sample remained negative towards the ads they had seen on tablets until now. Most consumers believe the internet as we know it would ‘disappear’ without ads, but most want want more information about the online ads they see and only 1 in 10 are willing to pay for advertising-free content, according to a new survey. The study, a report being published by the IAB UK and ValueClick, was based on 2,000 interviews carried out by Kantar Media - 650 face-to-face and 1,350 online. LBi, AMV BBDO, Wieden & Kennedy, Red Bee Media and Budweiser were this month honoured at the IAB’s annual Creative Showcase Grand Prix Awards ceremony. This video showcases the campaigns that took the top gongs at this year’s event. Online and mobile advertising leapt by 14.4% in 2011, to reach £4.8bn, marking a £687m rise on the previous year, according to the report from the Internet Advertising Bureau UK (IAB), conducted by PricewaterhouseCoopers. Despite the backdrop of a depressed UK economy, the increase represented the biggest boom in internet advertising in five years. Watch a video explaining the key findings here. Over half of visitors to the car brand websites were exposed to online activity such as display and search, with one in 10 subsequently converting, according to new research. The study, from the IAB, also indicated there is a ‘positive latent brand effect’ of display advertising within the automotive sector. The research looks into the roles all forms of digital media play in the customer conversion journey within the automotive sector. Mobile advertising spend has grown a massive 157% year on year increase to £203m in UK, up from £83m in 2010 to £203m in 2011. The study, from Internet Advertising Bureau and Pricewaterhouse Coopers, has revealed that the rise of mobile devices is increasingly creating a nation of so-called “triple screeners” – people who social network, surf the web and watch live TV simultaneously. UK advertisers spent more on online advertising than on TV in the first half of 2011, with the Web accounting for 27% of the total adspend, compared to TV's 26.1% share, according to new research. The surge in growth offset a slowdown in other forms of advertising, but the total advertising market still only grew by 1.4% to £8.27bn. The data, from the Internet Advertising Bureau (IAB) and PricewaterhouseCoopers (PwC), attributed much of the web's growth to fast-moving consumer goods (FMCG) companies turning to the internet to boost sales. Internet Advertising Sales House (IASH) was originally launched in 2006 to police the activities of sales houses and networks through an effective industry-agreed Code of Conduct, audited by ABC. With the advent of Ad Exchanges, Supply Side Platforms (SSPs), Demand Side Platforms (DSP’s) and other real-time operators within the network space membership of IASH will be open to more operators within the network ecosystem. Google is embarking on a multi-million pound planning tool to help brands understand consumer behaviour across TV and online media platforms. Google is working with research firm Kantar to build the panel, which will measure TV and online media habits. The project is designed to provide the industry with a greater understanding into consumer habits on an ongoing basis. A quarter of all advertising spent is now on the Internet, growing 12.8% in 2010 to reach a new milestone of £4,097m, according to the bi-annual advertising spend study from the Internet Advertising Bureau (IAB) and PwC. With total UK advertising spend in 2010 valued at £16.6 billion, this takes the internet’s market share to a record high of 25% (23% in 2009), meaning that £1 in every £4 invested by advertisers is spent online. New research from the Internet Advertising Bureau – the trade association for online and mobile advertising – reveals that mobile commerce has already become widely adopted in the UK, with 51% of mobile owners (23 million people) using their device to make payments, redeem coupons or research products and services. The study shows once again the urgent need for retailers to catch up with the mobile consumer and enhance the user experience to ensure they don’t miss out on sales. The study – based on a nationally representative sample of over 1000 mobile owners and carried out by work research - was designed to investigate genuine consumer engagement with m-commerce in the UK. When exciting new research landed from TNS, we thought we'd share it straight away rather than wait till the end of the month. Here are the topline points, with more on research and announcements from the global giants that caught our eye over the last two weeks. Digital Life is a global study into people's online behaviour. TNS interviewed around 50,000 people from over 45 countries to explore the different ways internet behaviours are evolving. They used consistent questions and built an interactive dashboard that lets you compare the data. Other stories we've been tracking include the race to TV (launches from Google and Apple), UK online adspend rising 10% (to just under £2bn in the first half of 2010), YouTube winning the copyright case in Spain, and in Antarctica Google's Streetview making its debut. As you plan your 2011 digital strategy, let us know if you need more on any of these areas, or support from the management coaches at the Digital Training Academy to ensure you choose the right digital channels for your audience. New research into online video ads shows that consumers want to investigate brands in their own time, and are more open to receiving ads around quality video content. The results of a year-long study from Sky and the Internet Advertising Bureau – the trade body for digital advertising - reveal the true branding effectiveness of online video, showing how consumers prefer to ‘store’ advertising information, rather than clicking-through immediately. The study, run by media research company Decipher, found that whilst 6% of people who recalled a video ad clicked to make an immediate purchase, around 54% of people chose to delay a purchase or investigate the brand in their own time, once again calling into question whether click-through rates are the best measure for online branding campaigns. Google went 'instant', Apple went Ping, Microsoft put IE 9 into beta and Twitter got pictures: what a month for giant digital product development from digital giants. All these impact on how digital strategies work for brands - and that's why to get them working well the strategy needs to be flexible to deal with the constant evolution of the landscape. Technology and business horizons are constantly expanding, the attention of customers is migrating, and brands need to be agile enough to deliver what their customers need today, not yesterday. Among the social networks Facebook gave social media metrics a much needed boost with their new analytics tools (ROI gradually creeping into social media), Twitter started looking even more like a Facebook-lite, and Facebook launched location tools to prevent young socnets like FourSquare gaining the traction of Twitter. Mobile device wars intensified with Blackberry and Samsung lining up tablet launches, and the largest smartphone maker - Nokia - reorganising 'in preparation for the next billion mobile web users' and its upcoming high-end device launches. The online video world was equally hectic with product development announcements from Facebook, YouTube, Yahoo and Google, proving that the video platforms have much more yet to deliver. The Internet Advertising Bureau - the trade association for digital advertising - has joined forces with Unruly Media to launch a new UK viral chart, showcasing the most popular branded video content in the UK each month. Recognising the increased significance of viral video content amongst the marketing community, but a lack of guidance in terms of how to 'get it right', the IAB will be highlighting the importance of creativity in video by celebrating the best and most popular. The chart will also live on the IAB site, and be sent to members each month.